Setbonus (4): Talent: Bei Verursachung von insgesamt 60.000 Schaden durch die Gruppe erhält man 1 Prozent Fertigkeitenenergie dazu bis zu einem maximalen Bonus von 100 Prozent. Der Bonus verringert sich jedoch jede Sekunde um 1 Prozent solange die Gruppe keinen Schaden mehr verursacht. Setbonus (4): Talent: Kopfschüsse markieren den Feind und erhöhen den Schaden um 15 Prozent für eine Dauer von 10 Sekunden. Ein Ziel kann bis zu drei Markierungen erhalten. Setbonus (4): Talent: Jeder nachfolgende Treffer verursacht 1 Prozent mehr Schaden, bei einer maximalen Grenze von 100 Prozent. Bei Fehlschüssen fällt der Bonus um 2 Prozent. Der Bonus reduziert sich um 1 Prozent mit jeder Sekunde. Setbonus (4): Talent: Nachdem ein fataler Schaden empfangen wurde, erhält man automatisch die volle Gesundheit. Kann alle zehn Minuten nur einmal eingesetzt werden. As you already know, we will be deploying update 1.1 in a few days. This is very exciting for all of us as it will be the first major content update since the release of the game! With it, we will implement new End-Game activities and a new layer of character progression with gear score 204 (equivalent level 32) items and Gear Sets items. However, as we add this new layer of character equipment to the game, we also wanted to seize this opportunity to address something that will change your end game experience significantly: the importance of crafting versus item drops. The Division is primarily a RPG. As such, gearing up your character is one of the main aspects and incentives to keep playing the game once the story missions are completed and max level is reached. As part of the End-Game loop, players are expected to obtain their equipment by trying to beat challenging activities, and be rewarded for it. As each player develops and perfects their build, he or she will be looking for very specific items that will contribute to that build. Looking for one specific item can be quite tedious, but it should also feel extremely satisfying when the item is finally acquired. The way our crafting feature is designed is to offer an alternative for players to temporarily complete their gear, by crafting missing pieces of their level. For End-Game we want crafting and our different in-game economies to provide reliable but slower source of gear compared to loot dropped from named enemies. If after many attempts you could not find said item, you should have acquired enough materials to try to craft something similar instead. It will not replace the item, but you will still be rewarded for your persistence. However, at the moment, loot drops are just too rare and disappointing, putting too much of an emphasis on crafting: you are looking for crafting materials and may sometimes end up dropping an interesting item in the process. This is clearly illustrated in the following graphs. 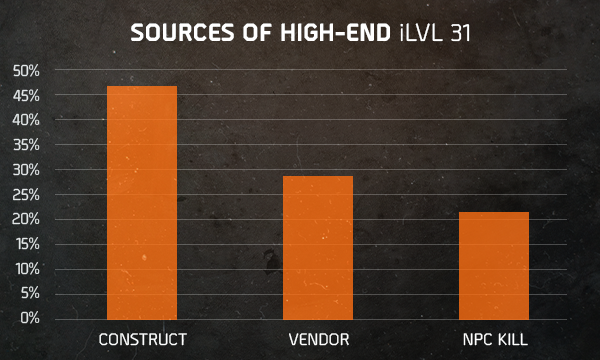 Here you can see how many Item level 31 High-End items were acquired through crafting compared to items acquired as loot drops. As many of you pointed out in the past weeks, the end result does not provide the level of fun that we had hoped for. To address the situation, and simply make End-Game more satisfying and more focused towards improving your build one piece at a time, we will be implementing a series of changes with update 1.1, some of which have already been communicated in the Patch Notes, and others that we are about to reveal now. From now on killing a named NPC will grant you a guaranteed High-End drop! That’s right, you will now always get a High-End item from killing a named NPC of level 30+. The gear score of said High-End will be determined by the level of the NPC. For example, a level 30 named will guarantee a gear score 163 High-End. With so much more High-End drops, you’ll quickly notice that crafting High-End items, while more expensive, will not necessarily be much more complicated. To make sure that crafting remains a viable alternative, we will also increase drop rates of Division Tech materials to 40% on level 32 named enemies in the Dark Zone. New drop tables have been designed to grant you just enough control to focus your efforts on specific NPCs, depending on your need. Each named NPC will now have more chances to grant a specific type of High-End item. By discovering the specificities of each named NPC, you will quickly learn which ones you should focus on in order to obtain specific items. By changing the conversion rates, we will encourage players to use their low level materials while they are leveling up, instead of saving them until they reach level 30. It will also bring more decision making between selling and deconstructing low quality items. Most High-End materials should come from deconstructing High-End items, and not deconstructing lower quality items to then convert these materials into High-End ones. Similarly, lowering yields when deconstructing items will also lower the efficiency of items farming. Once again, we want you to consider deconstructing and material converting as an alternative when you get an item that doesn’t contribute to your build, and not the main mean to develop your build as a whole. These changes will not only make crafting and dropping more coherent towards each other, but will also make it feel much more fun and rewarding. Balancing an online game is no easy task, and while we believe that these changes are a step in the right direction for the future of the game, we will keep monitoring the situation and address what needs to be modified. But more than that, we will have an eye on all aspects of your experience, and balance things when needed. Sometimes it means making hard decisions that might not be appreciated, and when this happens we will make sure to give you the visibility you need to understand why these decisions are made. Your feedback is very valuable to us, so keep the discussions going, we will be reading!